This case study has been carried out in collaboration with the Urban Forestry Department, City of Richmond, Virginia. Richmond City performed a street tree planting project on Jefferson Davis Highway in 2012-2013. In August 2013, on road medium of a block of south side of Maury Street, TreeDiaper36 was installed and covered with mulch. Adding the mulch on the top of TreeDiaper36 can prevent vandalism and keep natural looking outside. On a road medium a block of north of Maury Street, standard watering bags remained on the trees. Annual natural precipitation in Richmond of Virginia is generally above 40 inches. Seasonal drought occurred on July 2014 (~1" rainfall) and August 2016 (~1" rainfall) and severe winters occurred 2013-2014 (-15°C) and 2014-2015 (-10°C). Since the installation of TreeDiaper36s and by the end of 2016, trees on south side of Maury Street have not been provided any maintenance services such as watering and deweeding (grass mowing around the trees were kept as normal). The north side of Maury Street received regular maintenance services. Trees with TreeDiaper® Advanced Hydration System all survived and grew green and strong as of June 2017 as shown by Google Street View Images. 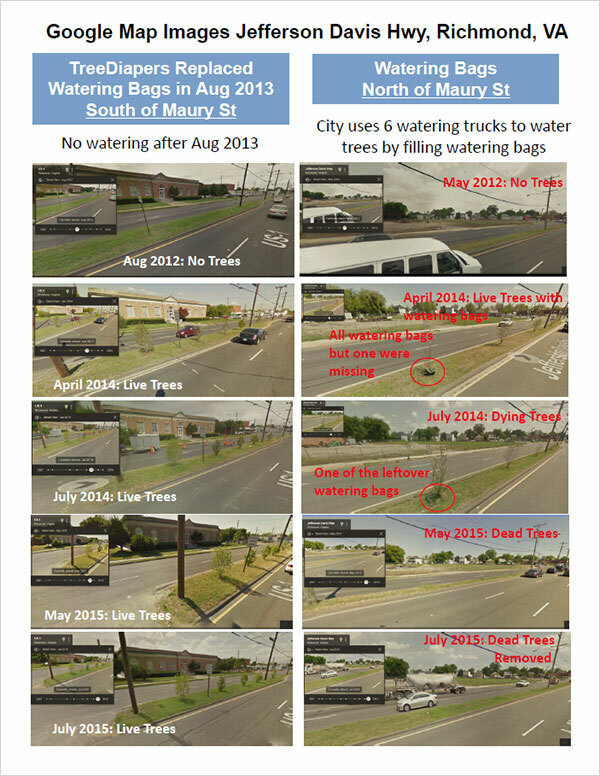 Trees with standard watering bags died (July 2014, and was removed between April-July 2015 as demonstrated by the Google Street View Images. No mainenence was needed for trees with TreeDiaper® advanced hydration system during the testing period. Investment on trees (~$250/tree) from City was saved by using TreeDiaper® advanced hydration system. 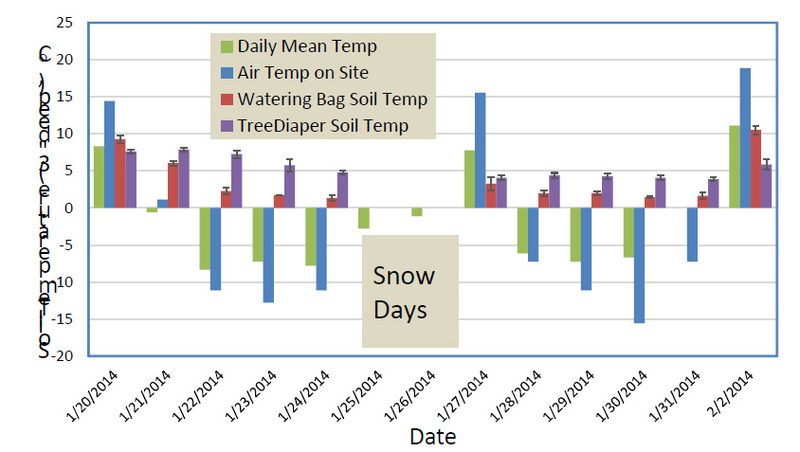 Soil temperature maintained a higher temperature during winter storms (Figure 2) and maintained at a cooler temperature during hot summer days. If you are interested in this study, you can view the Google Maps history by searching "Jefferson Davis Highway, Richmond, VA." Look for the intersection between Maury Street and Jefferson Davis Highway. Figure 1. 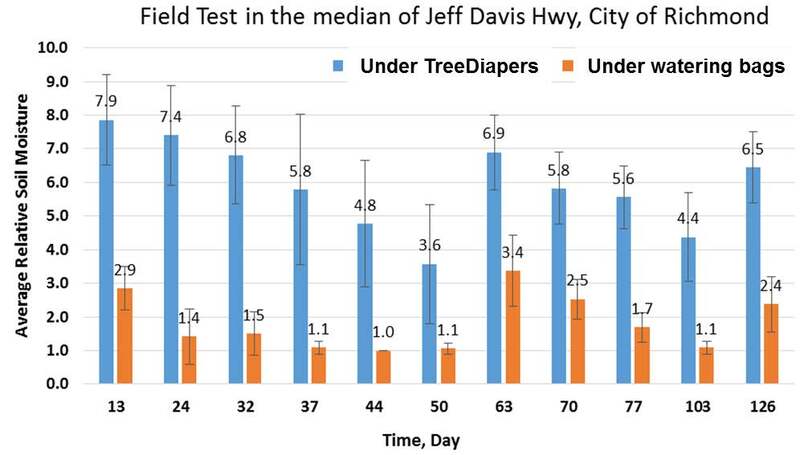 Soil moisture of TreeDiaper® mats compared to watering bags in the road median of Jefferson Davis Hwy, Richmond VA. Figure 2. Soil temperatures (3" below soil surface) on Jefferson Davis Highway of City of Richmond in January-February 2014.